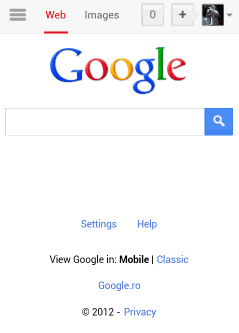 Google's mobile homepage and search results pages have a new interface. The homepage only links to Google Image Search and you have to tap a button to find all the other Google services. The idea is reminiscent of the "hidden" navigation menu launched last year and quickly replaced by the black bar. Search results pages don't include the menu, so you can no longer open Gmail from a search page and you have to go back to the Google homepage first. 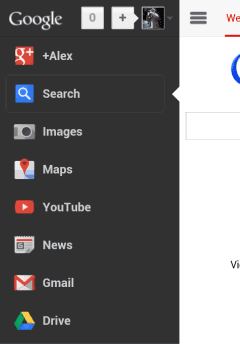 The search box has been shrinked, there's a bigger Google logo and the links to specialized search engines are displayed below the search box, just like in the tablet interface. Have you seen that you can swipe left-right the bar of "Webs Images News" ? Yes, it looks just like the tablet interface. Tap "more" and you can find "maps, videos, shopping, books, blogs, flights, discussions, recipes, applications, patents". Way better, as seems more consistent with the regular UI. I don't like it. Makes it harder to choose news. They want to simplify but all change does is confuse. They won't let people get used to it before changing it again, so what's the point? Not working / Debugging is needed? I am using google search on my phone (Android, Bionic) as most of us, many times a day, love google + its major apps (Maps, Drive, google + etc). 3. Try and revisit the search line in order to optimize / change my search (common need)- can't get there more than 80% of the time. Please allow to opt out of this new interface, until it fits (perfectly) all phones and tablets, as the older interface. If you have problems, read the Blogger's New Interface Tutorial. Awesome interface. I really liked it. Looks pretty cool I will check this out in more detail. It is always helpful to find easier ways to do things of course when you have such a busy life. 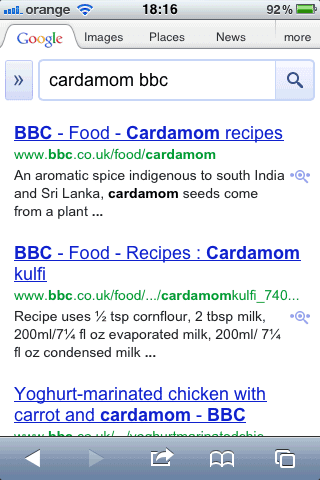 Where did slide out option choice of narrowing search by country? I am now getting search results based in USA even though I am Canadian. 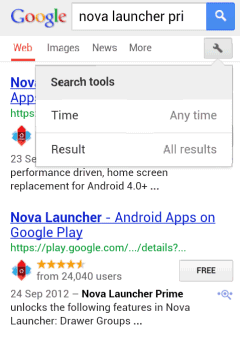 Used to give option from left side when u tapped slide out menu to choose results from Canada. 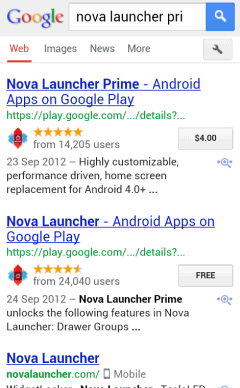 Why if I search for example a plumber would u want USA results? Answer? I don't. Hate this constant change for so frequently disallowing us time to adjust.